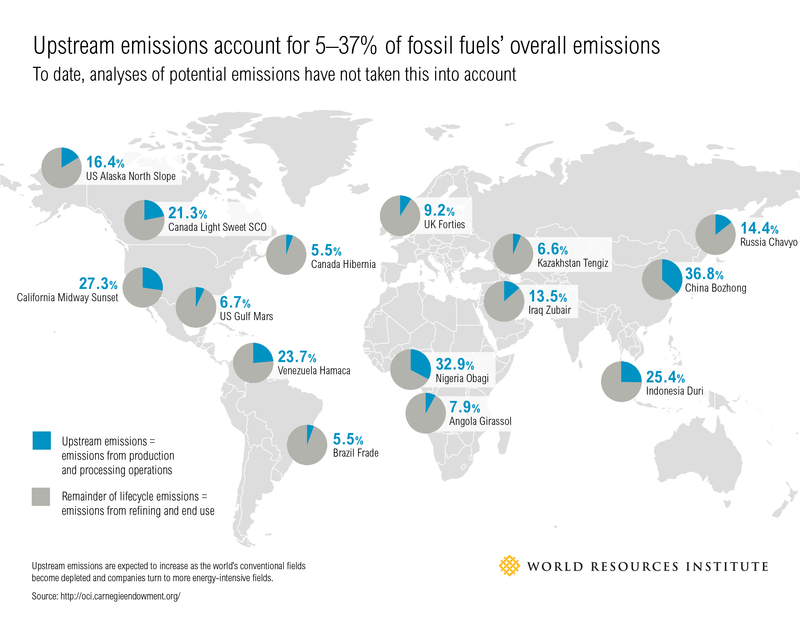 Although the burning of fossil fuels generates most of the potential emissions from most reserves, emissions from production and processing operations (known as “upstream emissions”) can also be important, depending on the reserve type and technologies used. This map shows the upstream emissions from a small subset of the world’s oil and gas reserves, relative to the deposit’s total life cycle emissions. For example, oil sands deposits, such as those commonly found in Canada and Venezuela, are a mixture of sand, water, clay and bitumen. Bitumen is oil that is too heavy or thick to flow through pipes without being diluted or heated; both these processes require the use of additional energy, resulting in greater emissions. Tar sands are also often located deep underground, meaning more advanced technology and energy are required to reach and extract them. Deposits with lower percentages of upstream emissions are those that are less gassy, heavy, water, and difficult to access.